Owner: The Inglis Area Heritage Committee Inc. 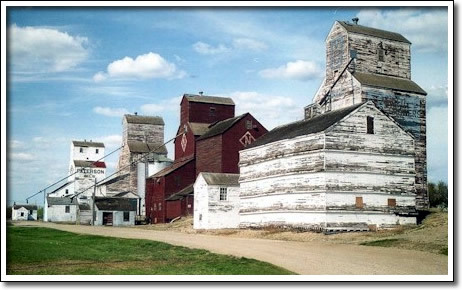 Grain elevators are Prairie icons, powerful, stately reminders of our agricultural history. Almost every Manitoba community had at least one, and large centres often boasted a whole set, lined up along the rail track. The five elevators in Inglis are remarkable. They are not only the last example in Manitoba of an elevator row, they are also the best remaining example in Canada. In fact, in 1996 the line was declared a site of national historic significance. Built over the course of forty years, during the "Golden Age" of grain elevator construction (1900–1940), the Inglis elevators are a virtual textbook case of Manitoba's elevator history. They represent the full range of ownership types: from the large Canadian and American-backed companies, the smaller family-owned concerns, to farmer co-operatives. They also have survived largely unaltered, each boasting intact internal workings.